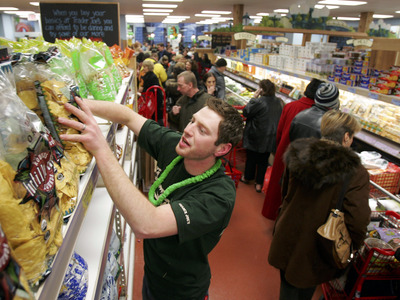 I never really understood people’s obsession with Trader Joe’s. Most New Yorkers I talked to considered it a necessary evil where prices are inexplicably low but lines are long. All I saw was the miserably long lines — at some Trader Joe’s in New York City, lines stretch around the whole store and spill onto the footpath outside. You’re forced to shop while you’re in line. I just didn’t think the prices justified wasting so much of my precious free time grocery shopping. And then one morning my boyfriend offered me a blueberry bran muffin with peanut butter on top, both items he had bought during one of his weekly shopping trip to Trader Joe’s. I took one bite and was hooked. Not long after I made a quick trip to one of the city’s less-crowded TJ locations in the middle of a weekday. Lines weren’t excessively long, I bought a fair amount of groceries, and didn’t pay all that much considering what I had bought. Ever since then I’ve been a somewhat-regular TJ’s shopper. Here are the products that keep me coming back. I know what you’re thinking: fat free blueberry wheat bran muffins? Bleh, those must taste like cardboard. Well, these actually don’t. They’re naturally sweetened with fruit juice so they’re sweet but not overly sweet, and their individual size makes them great for a breakfast side or a quick snack before working out. They’re best when heated up in the microwave for 10 seconds and eaten with a little smear of butter or peanut butter on top. 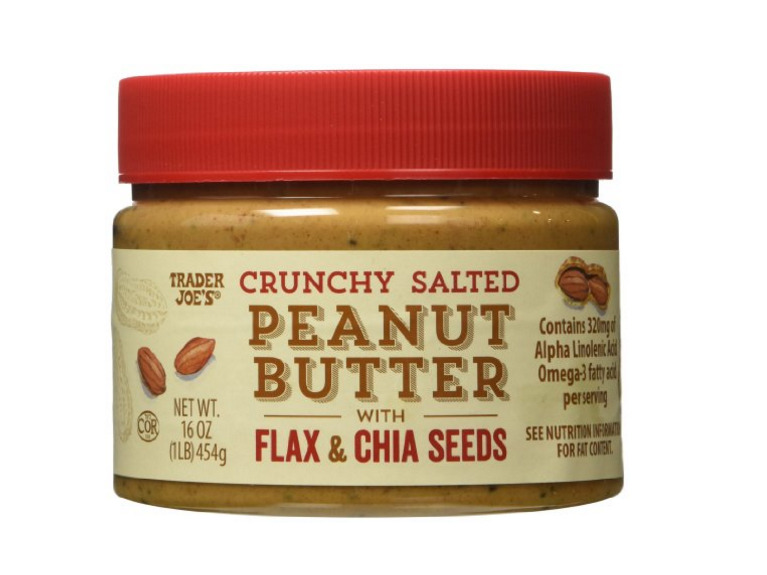 Another product that sounds overly healthy, this peanut butter still tastes delicious. The name is slightly misleading in that it’s not crunchy because of peanut pieces; the crunchiness refers to the flax and chia seeds. So there’s not actually a whole lot of crunch. The peanut butter itself is smooth and creamy, and it’s only slightly salted. If you’re looking to spice up your sandwiches and make them on something other than bread, try these wraps. They’re small and only 45 calories each, so I usually eat two and fill them with anything from turkey and cheese to tuna or chicken salad. They don’t take away too much from what’s wrapped inside them, and you won’t feel overly full after eating them either. Trader Joe’s realises that chocolate chip cookies were made to dunk into a glass of milk, which is why they offer dunkers. 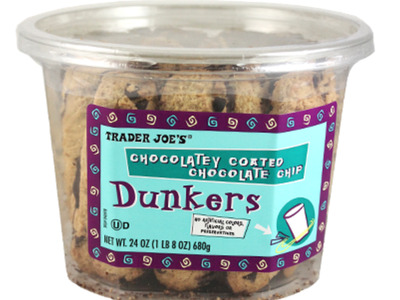 It’s a long rounded chocolate chip cookie with a bottom coated in chocolate that’s deal for dunking. By itself it’s crunchy, but once you add milk, the cookie transforms into the perfect texture. I don’t eat soup all that much, because I usually find it to be way too salty. That’s the beauty of this product: it’s creamy and delicious, but it tastes fresher than most tomato soups because it’s not overwhelmed with salt. Plus, it’s one of the easiest products to “cook.” Pour the soup from the jug into a pot and heat for a few minutes on the stove. 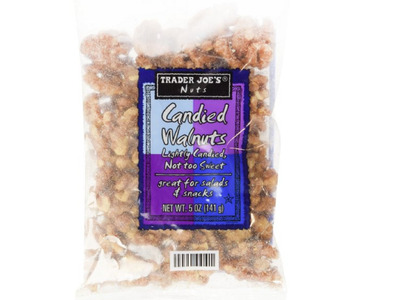 These “lightly candied, not too sweet” nuts will take any salad to the next level. Every time I throw a few in my salad, I end up eating a few more on their own just because they’re really tasty. The first time I made risotto, I decided to avoid the risk of screwing it up by making frozen pre-packaged risotto. Once you’ve microwaved the packet of sauce that comes in the risotto package, all you have to do is combine it with the rice and veggies and let it simmer on the stove, stirring occasionally. It comes out tasting creamy and flavorful, and not like it was once frozen. I love salmon, and I used to pay a fair amount of money to buy pieces of grilled salmon at prepared food counters around the city. 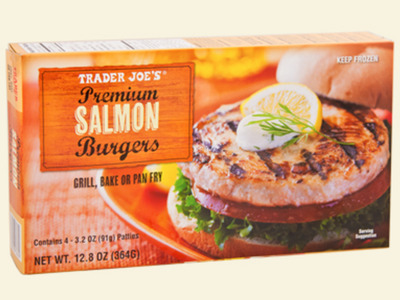 Then I tried TJ’s salmon burgers (made with salmon from Alaska), which come in a box of four for $5.99. Besides their unbeatable price, the burgers are incredibly fresh-tasting and they’re already lightly seasoned, so once you’ve cooked them on the stove, they’re ready to be enjoyed. I like these burgers for the same reasons I like TJ’ssalmon burgers. It’s wild caught Albacore tuna from the Southern Pacific Ocean that’s easy to cook, already seasoned, and fresh tasting, an all around win. 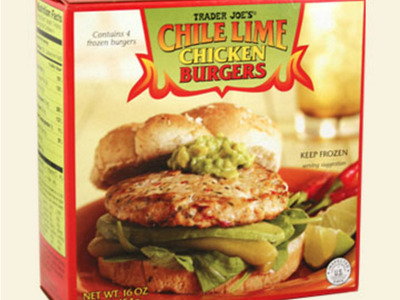 The box that these burgers come in would make you think that they’re pretty spicy. They’re actually not at all.They’re impressively flavorful for a chicken burger, and they’re delicious with a slice of cheese or some avocado, or both together. I’ve tried a lot of veggie burgers, but the reason I like this one is because it comes out crispy on the outside. It’s not simply a patty of mushed veggies, it has some texture to it, some seasoning, and just a little bit of kick. It’s not boring or bland, a common downfall of veggie burgers.